Someone recently told me that it is good to have a ‘mission statement’ for your blog. That way you know, and others will know what you are setting out to accomplish. Good idea. So here it is. I did not even contemplate a blog until about a month ago. It was a culmination of a few events. One of them was watching ‘Julie and Julia’ – the two true stories of Julia Child and Julie Powell, a blog writer, who decided to tackle cooking all of Julia’s 524 recipes in 365 days! Crazy, I thought, she can’t cook so many dishes in one year! But she did. The film is the first major movie based on a blog. 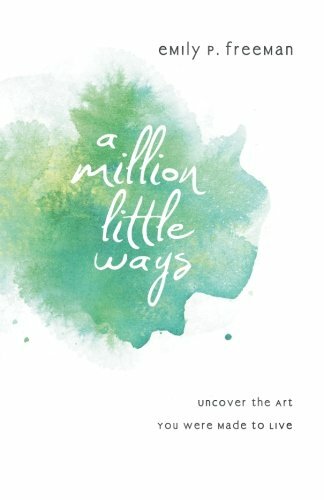 Next, was reading, and then listening to, and finally meeting Emily P. Freeman who wrote “A Million Little Ways”. In the book she encourages stepping out and doing the thing or things that God has placed within you to do. While reading her book I realized quite a few things about myself, one of them being that, yes, I do really feel like God wants me to write children’s stories. This last year I wrote one story, and only one. So I had this brain-wave idea of writing one story a night. A little on the unrealistic side, but inspired by the Julie/Julia thing too. What a novel idea to actually write as much as I can. I will let you know how that goes, as well as my journey in finding an agent and getting a story, or two published, hopefully. Love it! I was also greatly inspired by Emily Freeman. Thanks, yes, she truly has been gifted with insight and encouragement!